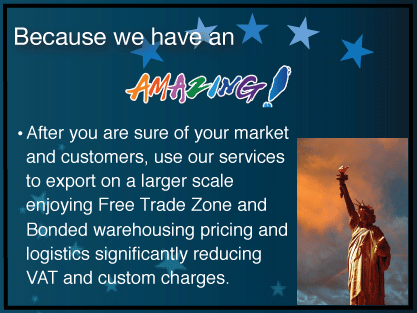 We help you export your “made in the USA” goods and services to China in the most efficient, and cost effective way, without spending tons of money on staff, travel, inventory or worrying about buyers, payments, exchange rates, customs, inspections, regulations or language barriers. Our sample marketing program, and boots on the ground approach is the best in-class. And our AmericaTowne® Import Trading Center exclusively for “made in the USA” goods and services is the only facility of its kind in China. Our Internet marketing, seller and buyer matching, and buyer financing programs provides you with a complete export solution. With the support of the US Commercial Services, and Meishian and Ningbo Governments, we work with U.S. Small- and medium-sized business (SMEs) exporters using our USA on-line trading platform and AmericaTowne® Import Trade Center facility located in Meishan Island Ningbo China. The Import Trade Center – the only Center of its kind in China – is dedicated to introducing “USA made” goods and services to China. The 18,000 sq. ft. showroom and office accommodations and on-line platform are permanently located in Zhejiang Province, one of the wealthiest areas in China. The Import Center located at Meishan Ningbo Port - a major Bonded Port (Free Trade Zone with preferential policies at the highest and most advanced level in China) offers many concessions for U.S. based businesses that lowers your cost to market and allows products to be sold at competitive prices in China. The preferential policies alone can help cut cost by 5%-30%. Our Marketing Sample and Test Program save you money, time and resources. The Marketing Test Program requires - no inventory – no human resources – no travel – no cost for trade shows – no learning a new language – and no looking for buyers. The cost to export is minimum. With our Sample Test-Marketing pProgram, you can test the market – and land orders - before you spend or ship inventory. We’ve partnered with the government of Meishan Ningbo, along with our USA based team and our 50 plus dedicated Chinese Staff with boots on the Ground in China; providing a level of buyer matching support, customs clearance and inspection, deal flow, concessions and tax breaks, buyer financing, export insurance and just plain business delivery that is unprecedented for a private company. Because of our agreement with the local government in China we receive preferential treatment on commodity inspection and customs clearance, as well as preferential policies. All these are passed on and enjoyed by our export members. That Is Easy - Affordable - Effective! We export across China to Business to Consumer using our e-commerce Platform and Business 2 Business using our Import Trade Center Platform. The Trade Center features an Investment Center Showroom highlighting USA private or local government investment projects looking to promote and fund their US project in China. Copyright © 2009 - 2019, AmericaTowne Inc., All rights reserved. Policies. No portion of this site may be duplicated, redistributed or manipulated in any form without the expressed written consent of AmericaTowne Inc.
USA Exports to China.com meet the growing demand by Chinese consumers for more USA made goods and provide a platform for US small and mid size businesses to export to China. The Company has signed an agreement with the City of Meishan Island Ningbo China to establish and operate an International AmericaTowne® Branded Trade Center. The AmericaTowne® Branded Center a subsidiary of Yilaime is a Wholly Owned Foreign Company being registered in China and serves as a distribution point for the Company’s exports to China. AmericaTowne® Branded Center acts as an American Company in China for many small and mid size businesses. The Company will focus on five core business areas. 1. Exported food, agricultural, fishery and forestry products, personal care and daily necessities products, home decoration, accessories, and handicraft. 4. Exported AmericaTowne® Leisure Community development, and senior care facilities, senior care products, and senior care services. 5. Exported high-end technology, other imported items and investment and financial services.